We have distributors in Australia, USA, UK, Brunei, Malaysia, China, Germany, Netherlands, Belgium, Luxembourg, Switzerland, Austria and Singapore. Due to its slick design the 240 Volt unit with Timer quickly became our best seller. Made with stainless steel and security screws, this machine was built to last and withstand the harshest environments. Measuring 210mmH x 385mmW x 55mm and made with raised angled sides to prevent attachments and vandalism. The lighter only heats for 10 seconds regardless of how long the button is pushed giving you peace of mind that it won’t be abused and exploited. We offer variations suitable for most types of installs and power requirements. Mounting Style Wall mounted unit or portable with carry handle. Lighting Method The Lighter is on for as long as you hold the button. Dimensions 310H x 210W x 125D Power 2100mah Battery. Approx 400-500 cigarette lights before charging. 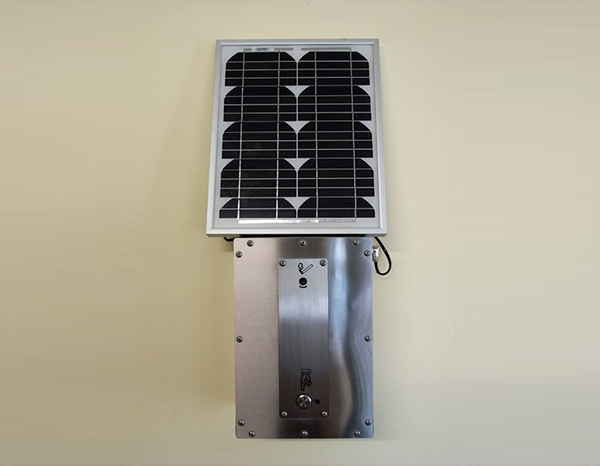 20 watt solar panel. Connecting cable is standard at 7mtrs but we can supply with any suitable length. Resettable 10 amp fuse mounted on side for easy access. What is a flameless cigarette lighter? Ozilite’s automatic flameless cigarette lighter uses extremely effective electric heating technology to deliver the right amount of targeted heat energy to light a cigarette, without an actual flame. The heating element is recessed, so there is no danger of it coming into contact with nearby flammable materials. When you buy an Ozilite no flame lighter, you get two spare long lasting elements, giving you a lifetime of safe cigarette lighting. Unlike portable units, Ozilite has been designed with long term use in mind, making it an ideal fixture for facilities on a budget. 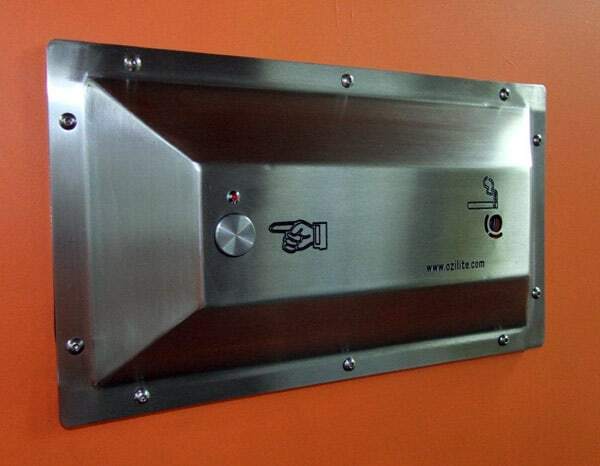 The stainless steel face plate is durable, vandal proof and has no hazardous sharp edges. The unit itself is completely waterproof and weatherproof, meaning it can be installed outside and will still function in all weather- it can also be hosed down, for more efficient cleaning. Inside, the Ozilite is fitted with safety shut-off features that prevent overheating, as well as interference from tampering. Ozilite has become a trusted name in safety cigarette lighters because of its safety and security sensitive design. 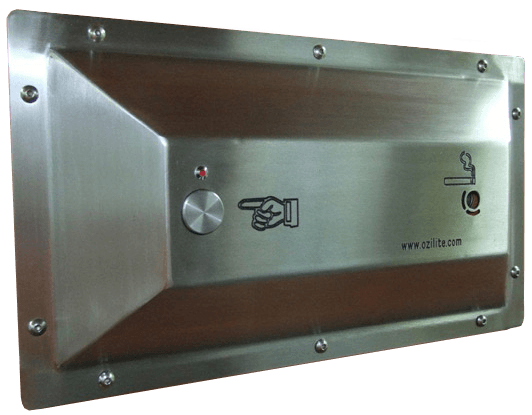 It is the ideal solution for areas in which regular cigarette lighters may be banned, from manufacturing plants to correctional facilities and more. 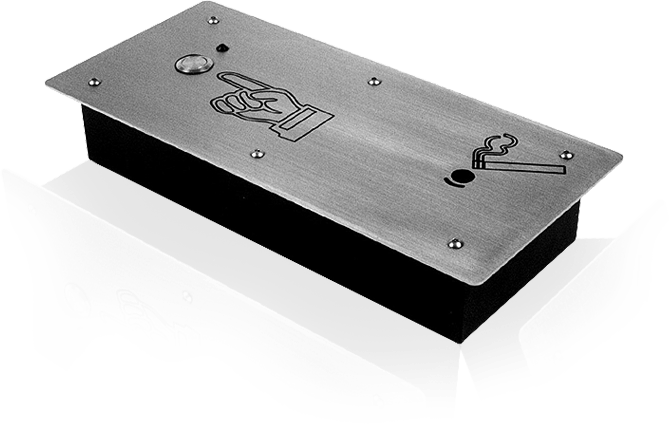 Our no flame cigarette lighters are installed in public and private locations across the globe; we have central distributors in Australia, the USA, UK, Brunei, Malaysia, China, Germany, the Netherlands, Belgium, Luxembourg, Switzerland, Austria and Singapore. When you buy an Ozilite safety lighter, you also get the security of our great international warranty. 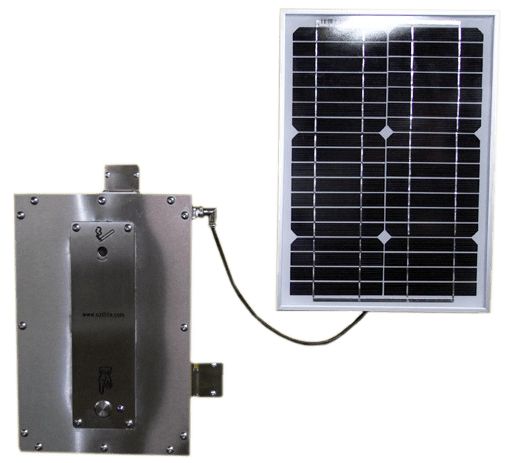 We invite you to browse the variety of models we offer, including everything from flush wall mounted units to flexible wall mount or portable units- the Ozilite even comes in a solar charged model! Ready to buy electronic lighters and improve your venue or facility? Request a personalised quote today- just use the ‘Request Quote’ form above, or contact your local Ozilite distributor directly via the details on the ‘Contact’ page.